It’s twins – sort of. 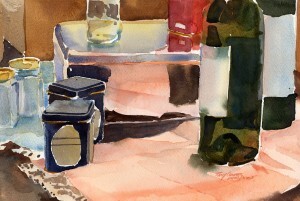 This painting was actually done at the same time as yesterday’s painting – “Studio Objects with Blue Cloth”. It’s the exact same set up viewed from the opposite side. So the same objects are being seen from the back, with new space and shape relationships and the addition of a pink cloth. Featured again is the silver box, or rather the reflections the faces of the silver box. Again, the cloth is light in color so changes in color and value caused by shade and shadow are subtle. Again, an observational and color mixing challenge. It’s been a real nice change of pace to work on these studio still lifes for the past few days. There will be more, but soon it’s back to the landscape.